Today our oceans are under increasing pressure from activities such as fishing, pollution and tourism. There is a rich diversity of marine life in Lyme Bay and it is important that this habitat, and the species that live here are protected and conserved. Click here for more information on the marine wildlife of Lyme Bay. Our aim is to encourage people to use, interact with and enjoy these areas whilst maintaining the balance with conservation. The region is steeped with maritime history and today, the local economy is dependent on the sea for both the leisure and fishing industries. Human activity is putting pressure on the environment, for example some fishing practices such as dredging and trawling are damaging sea floor communities. If a fine balance can be struck between using this resource and protecting it, then the sea can continue to provide food, jobs and recreation for generations to come. In 1997 parts of Lyme Bay were identified as a Voluntary Marine Conservation Area (VMCA). VMCA’s are areas of coastline with particular wildlife and scientific value that rely on voluntary protection. They are run by a range of organisations and groups which are often supported by community or volunteer groups. The aim is to promote the seashore code as a means for the public to treat the coastline with care. In 2008 an exclusion zone of 60 square nautical miles was introduced in Lyme Bay. 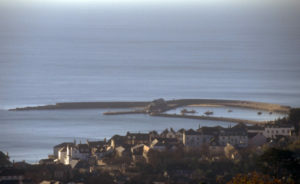 The zone, which makes up about 10% of Lyme Bay, is protected from scallop dredging and trawling which damage seabed communities. These areas provide protection to marine species or habitats of European importance. The Lyme Bay and Torbay Special Area of Conservation was created in August 2010 and has been submitted to the European Commission to be included in a European network of protected areas. It includes inshore waters from the western end of Chesil Beach to Beer and an area around Torbay. The site has been selected based on the habitat which includes the Lyme Bay Reefs and Sea Caves around Torbay which both support a variety of marine life. For more information please go to www.naturalengland.org.uk. The Marine and Coastal Access Act was introduced in November 2009 and will ensure that our seas remain healthy and full of life. This will be achieved by coordinated management of the oceans and sustainable development of the marine and coastal environment. New protected areas called Marine Conservation Zones (MCZ) will be set up under the Act to protect nationally important marine wildlife, habitats, geology and geomorphology. The aim is to have a network of marine protected areas around the UK by 2012. The Act will also improve access to the coast by creating a continuous signed and managed route. For more information please go to www.defra.gov.uk. 1. Sustainable seafood – Choose sustainable seafood by looking for the Marine Stewardship Council (MSC) logo when buying fish or go to www.fishonline.org for information on the seafood to eat and what species to avoid. 2. Re-use & Recycle – Re-use plastic bags and recycle where possible. 3. Avoid plastic – Avoid plastic bags and packaging which can harm marine wildlife if it ends up in the sea and on our beaches. 4. Litter – When at the seaside make sure your rubbish ends up in the bin and why not join in a beach clean. Check our events programme to find out if there is a forthcoming beach clean at Charmouth. 5. Seashore Code – Exploring the seashore? Always follow the seashore code.